After nearly 40 years together Motörhead has shown no signs of slowing down. 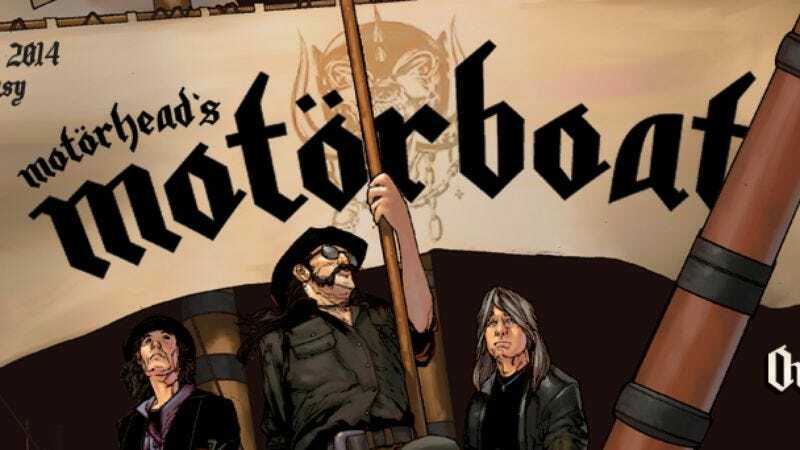 This year the band announced Motörhead’s Motörboat, a cruise taking place September 22-26 and featuring some of metal’s elder statesmen such as Megadeth, Testament, Anthrax, High On Fire, Down, and more. The A.V. Club is giving away an ocean view cabin for two on the cruise, the details of which can be found below. Winners will need to find their own way to the cruise’s launch in Miami, and taxes to the tune of $215 a person. To enter, just fill out the Google Form below that will serve as an entry in the contest as well as a statement that the terms and conditions have been agreed to, all of which can also be found below. NO PURCHASE OR OBLIGATION NECESSARY TO ENTER OR WIN. A PURCHASE WILL NOT INCREASE YOUR CHANCES OF WINNING. 1. ELIGIBILITY: This contest (“CONTEST”) is open to legal residents of the continental United States and Canada (excluding Quebec), who are 25 years of age or older at the time of entry. Employees of Motorhead’s Motorboat (MB), ASK4 Entertainment, Whet Travel, Carnival Cruise Lines, and their parent, affiliates, subsidiaries, advertising or promotional agencies together with their immediate families (spouses, parents, siblings, and children) and persons living in the same households as any of those employees are not eligible to participate in this Contest. This Contest is void where prohibited by law. a) Odds of winning depend on the number of eligible entries received.b) One (1) standard Ocean View stateroom for two (2) onboard the MB cruise, September 22-26, 2014, will be awarded. Approximate retail value: USD $2,300.00. Spa services, casino, gift shop, excursions and any optional onboard expenses are not included. A minor may accompany Winner as a guest only if the Winner is the minor’s parent or legal guardian. Minor must be accompanied at all times during the cruise by minor’s parent or legal guardian. All MB terms and conditions, the Carnival Cruise Line Ticket Contract of Passage, as well as those stated in the General Information of the Sponsor’s brochure/website, shall be applicable to this promotion and cruise passages. All details of the Prize shall be determined solely by Sponsor.c) Potential Winners will be notified by e-mail, phone, or overnight mail (eligibility is subject to verification). Return of any Prize or Prize notification as undeliverable, if Sponsor is unable to contact the potential Winner after reasonable effort, or failure of potential Winner to respond within three (3) days of first attempted notification, will result in forfeiture of Prize and selection of an alternate Winner. d) This Contest is governed by the laws of the United States and Canada (excluding Quebec) and all federal, state, provincial and local laws and regulations apply. Non-Commissionable Fares, Taxes, transportation to cruise and on board expenses are the sole responsibility of the Winner. Sponsor’s determinations regarding the awarding of Prizes are final. No Prize substitutions except as provided herein. Prizes are non-transferable. a) Potential Winner may be required to sign and return a Passenger Prize Confirmation which includes an Affidavit of Eligibility/Release of Liability and, where legal, a Publicity Release within fourteen (14) days of first attempted delivery. Noncompliance within time period or return of any reward notification as undeliverable may result in disqualification and selection of an alternate Winner. b) By accepting the Prize, the Winner grants to Sponsor the permission to use his or her name, likeness, picture, address (city and state), e-mail address, voice, biographical information, and written or oral statements for advertising and promotional purposes in promoting or publicizing the Sponsor and its products and services, and editorial and trade purposes without further compensation, unless prohibited by law. You shall have no right of approval, no claim to compensation, and no claim (including, without limitation, claims based on invasion of privacy, defamation, or right of publicity) arising out of any use, blurring, alteration, or use in composite form of your name, picture, likeness, address (city and state), email address, biographical information, or entry. The rights granted under this paragraph shall extend to all Entry Materials related to the Contest. c) By accepting Prize, Winners represent that they have complied with all rules of this Contest and agree to release and hold harmless Sponsor, and their respective parents, affiliates, subsidiaries, officers, directors and employees, crew members, media partners, printers of promotional material, promotional material suppliers, and advertising, promotion and other coordinating agencies involved in the promotion from any and all liability for injuries, losses, or damages of any kind sustained in connection with the use, acceptance, possession or awarding of Prize or participation in any Prize or related activities, including the Contest generally. Winners further acknowledge that Sponsor has not made, and is not liable or responsible for, any warranty, representation or guarantee, express or implied, in fact or in law, relative to any Prize, including, but not limited to, its quality, mechanical condition, or fitness for a particular purpose. d) No more than the advertised number of Prizes will be awarded. Entries become the property of Sponsor and will not be acknowledged. In compliance with United States Internal Revenue Service regulations, the Sponsor will send a Form 1099 to any Winner receiving a Prize valued in excess of $600 (USD), which requires disclosure to the Sponsor of the Winner’s social security number. The Winner remains solely responsible for paying all federal and other taxes in accordance with the laws that apply in your state of residence. 5. GENERAL: Sponsor reserves the right, in its sole discretion, to modify, suspend or terminate the Contest should a virus, bugs or other causes beyond the control of the Sponsor corrupt the administration, security or proper play of the Contest, as determined by the Sponsor in its sole discretion. In such event, the Prize may be awarded by random drawing from among eligible entries received up to the date/time of corruption or modification, to the extent feasible. Sponsor is not responsible for late, lost, incomplete, or misdirected entries; computer system, phone line, electronic equipment, computer hardware, software or program malfunctions, or other errors; failures or delays in computer transmissions or network connections; problems downloading entries from the web site; or for any other technical problems related to web site entries. Sponsor is not responsible for incorrect or inaccurate entry information, whether caused by Internet users or by any of the equipment or programming associated with or utilized in the Contest, or by any technical or human error which may occur in the processing of the entries in the Contest. The use of any automated launching or entry software or any other mechanical or electronic means that permits the participant to automatically enter repeatedly is prohibited. Any entries found or suspected to be submitted in this manner will be deemed ‘void’ by the Sponsor. Caution: any attempt by a person to deliberately damage any website or undermine the legitimate operation of this Contest is a violation of criminal and civil laws and should such an attempt be made, sponsor reserves the right to seek damages from any such person to the fullest extent permitted by law. In the event of a dispute, entries will be declared made by the authorized account holder of the e-mail address submitted at time of entry. “Authorized account holder” is defined as the natural person who is assigned to an e-mail address by an Internet access provider, on-line service provider or other organization (e.g., business, educational, institution, etc.) that is responsible for assigning e-mail addresses for the domain associated with the submitted e-mail address. 6. DISPUTES: Except where prohibited, all issues and questions concerning the construction, validity, interpretation, and enforceability of these Official Rules, or the rights and obligations of the entrant and Sponsor in connection with the Contest, shall be governed by, and construed in accordance with, the laws of the State of Tennessee, without giving effect to any choice of law or conflict of law rules (whether of the State of Tennessee or any other jurisdiction) that would cause the application of the laws of any jurisdiction other than the State of Tennessee. Jurisdiction and venue shall be solely within the courts of Nashville, Tennessee. Except where prohibited, entrant agrees that: (1) any and all disputes, claims and causes of action arising out of or connected with this Contest or any Prize awarded shall be resolved individually, without resort to any form of class action; (2) any and all claims, judgments and awards shall be limited to actual out-of-pocket costs incurred, including costs associated with entering this Contest, but in no event attorneys’ fees; and (3) under no circumstances will entrant be permitted to obtain awards for, and entrant hereby waives all rights to claim, indirect, punitive, incidental and consequential damages and any other damages, other than for actual out-of-pocket expenses, and any and all rights to have damages multiplied or otherwise increased. 8. SPONSOR: The sponsor of this Contest is Motorhead’s Motorboat, ℅ ASK4 Entertainment, P.O. Box 120956, Nashville, TN 37212.